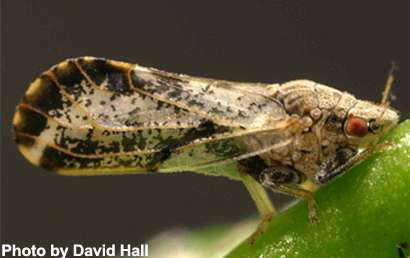 The Asian citrus psyllid (Diaphorina citri) carries a bacterial pathogen that causes citrus greening disease (huanglongbing), which is destroying trees in many countries and states, including Florida. It's been estimated that this insect-disease combination has cost Florida's citrus industry $1.3 billion in losses. The situation has become so bad that some citrus growers have abandoned their fields, leaving their trees untended, which can have dire consequences for neighboring growers. A new article in the Journal of Economic Entomology by Florida entomologists shows that the ACP, the insect's abbreviated name, can travel at least two kilometers in a twelve-day period, and that they are able to traverse potential geographic barriers such as roads and fallow fields. "The Asian citrus psyllid moves many kilometers," said Dr. Lukasz Stelinski, one of the co-authors. "If you control a small area and the other person does not, the psyllids will infest your area and can come from abandoned groves." While it was already known that insects like the ACP can travel—they have wings, after all—little was known about their long-range dispersal capabilities or the seasonality of their flight behavior. In order to learn more, the researchers used an in situ protein-marking technique along with traps placed in managed and abandoned groves. "One marks the insects by spraying a benign protein onto the crop—for example milk or soy protein—and the insects pick it up as they walk across the residue, so they are marked directly in the field." Dr. Stelinski said. "Then they are recaptured and tested. If you mark area A and you catch a marked psyllid in area B, then you know with 100% certainty that it moved from A to B. It's like the insect version of tagging an animal and tracking its movement." The authors recommend area-wide management practices to control the ACP and citrus greening disease, since citrus groves that are within two kilometers of any other citrus plantings are at risk. "The take-home message is, this is a mobile insect and ACP must be controlled on an area-wide scale as many growers are currently doing," Stelinski said. "The adults spread the pathogen, and they can move long distances over non-hosts, fallow fields, lakes, and roads." The scientists also have reason to believe that the psyllids tend to move even more after they become infected with the bacterium that causes citrus greening disease—which is the subject of a future paper.